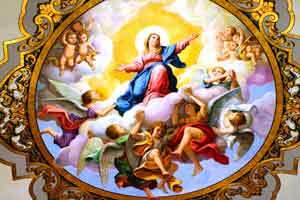 Assumption of Mary is a Catholic holiday that celebrates, through a feast, the Virgin, the mother of Jesus Christ when her spirit and body went to heaven. This holiday occurs on the 15th of August each year. Most Catholics go to church and attend to festivals consisting of sporting events, parades, markets, or communal meals. It is a public holiday, so schools, offices, and businesses are closed. The Assumption of Mary has been celebrated since the fourth century CE as it was an important date in Christian history. However it wasn't until Pope Pius XII ruled that it would be an official holiday in 1950.